Can I place an online order and collect from the store? Our Click & Collect service lets you order online and collect from our store at your convenience. 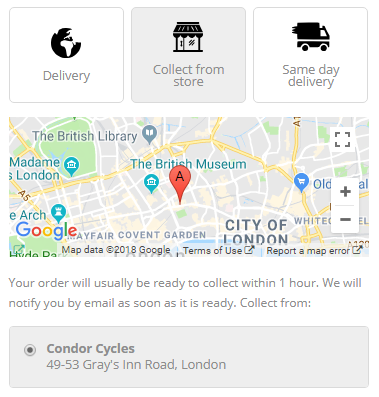 Orders are usually ready to collect within 1 hour of being placed. To place a Click & Collect order, simply follow the steps below. On some occasions, the item(s) ordered may be held at our warehouse and therefore not available to collect within our target time of 1 hour. If this is the case, we will get in contact with you. Above the checkout button, select 'collect from store'. Please note: your shipping country and currency must be set to United Kingdom and GBP respectively for this setting to be visible. If you are visiting our site from another country or via a VPN, please change this by clicking the country flag (on desktop you'll find this in the header, and on mobile, in the footer). We will send you another email as soon as your order is ready for collection.